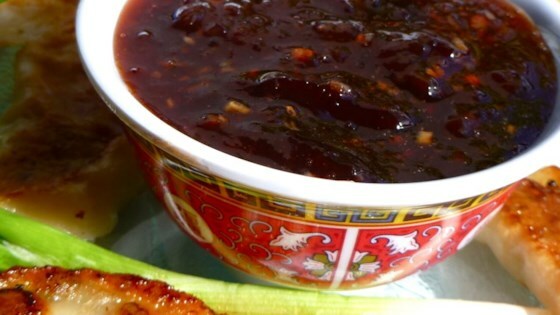 "This is an easy version of plum sauce that is very tasty and keeps well in the fridge. Serve hot or chilled, with egg rolls, pork or chicken." In a saucepan over medium heat, combine jam, vinegar, brown sugar, dried onion, red pepper, garlic and ginger. Bring to a boil, stirring. Remove from heat. Pork tenderloin roasted with firm fresh plums and caramelized onions. Good, but you can't make this ahead very easily. Once it cools down, it thickens up like jam. You must re-heat and serve warm. This is exactly the recipe I've been searching for. I had this sauce with chicken once in a restaurant and have been looking for a similar recipe ever since! Thanks Rayna! This was great! I used it for a thai chicken pizza and it was just what I needed! I didn't have plum jam so I used apricot and it worked great! Good recipe!